I had to laugh about the fake lake that's being banged about by the media in Canada. The almost $2 million media center for G8 and G20 in Toronto includes a fake lake, based on a lake in Muskoka. That's the district about 90 minutes north of Toronto where the G8 will be held June 25-27, 2010. The G20 is in Toronto June 26-27, 2010. The media center is located at Toronto's Direct Energy Centre. According to WikiAnswers, Ontario is home to around 250,000 bodies of water that are classified as lakes. Plus one fake lake. 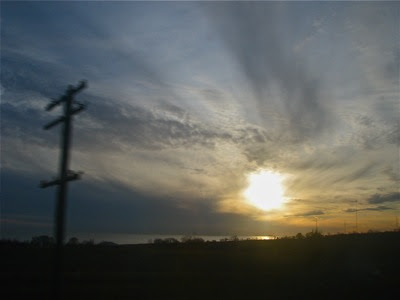 Sunset over Lake Ontario while aboard VIA Rail Canada from Ottawa to Toronto. Photo by Sue Frause.